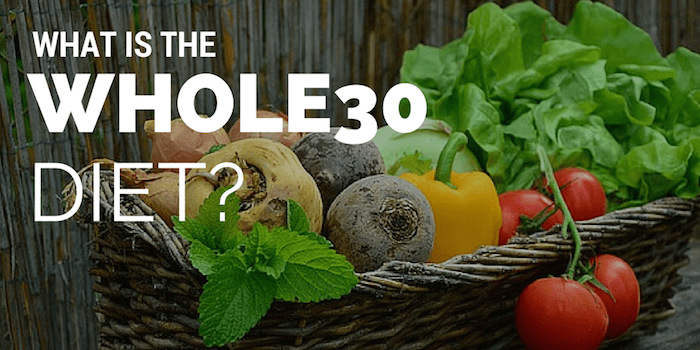 Whole30 Diet: What is the Whole30 And Should I Try It? Whole30 Diet: What Is It? The Whole30 diet is a month long, 30-day program revolving around clean eating. The goal? To change your relationship with food and restart your metabolism. Illnesses eliminated (some have testified to having acid reflux, autoimmune disorders, diabetes, infertility, depression, among a host of other issues, reduced or cured). And, of course, weight loss (many participants lose 10-12 pounds, with some losing significantly more). The idea behind the Whole30 diet is to eat only real food. If something has an ingredient you can’t pronounce, it’s out. In fact, if it has an ingredient at all, it’s probably out. The Whole30 diet is about 100% whole, real, natural foods. The reason for this is that going cold turkey on some of our bodies best enemies (like sugar and grains), you’ll be able to strip your body of the hormone-unbalancing, gut-disrupting, inflammatory foods. Sadly these are foods we love, but the Whole30 diet argues that they are wolves in sheep’s clothing. The ultimate goal is to do a hard reset on your body and re-teach it to love what is good for it – whole, clean, simple foods over the processed crud we’re so addicted to. If you’ve ever dipped your toe into the Paleo diet, you’ll find that it is very similar to Whole30. To understand the differences (and there are a few important ones), check out our post on the differences between Paleo vs. Whole30. Whole30 is a tough run, but it’s the kind of accomplishment you can feel great after. The Whole30 diet is strict to be sure – but it’s only 30 days! You can do anything for 30 days. This diet really could change your life. So why not have a go and give it your all? Where to Start With Whole30? Before you start tossing out your honey and burning those potato chips in a fast food bonfire, read It Starts With Food. This book was written by the Whole30 creators and goes into great depth as to why the Whole30 diet is so important. Many advocates of the Whole30 program have noted that reading the book has helped them tremendously in sticking to the diet because it helps them better understand how important clean eating is and how our food affects our bodies and selves. Once you’ve decided to go ahead and try Whole30, be sure to check out our extensive Whole30 shopping guide to help you navigate the grocery store and figure out what you’ll need. Have you done the Whole30 diet? What’s your take on it? Share your experiences in the comments! Still, we won’t leave you hanging. Here’s a more comprehensive Whole30 shopping list. Feeling “LIST” and have no idea what Whole30 is? Check our our explanation of the Whole30 diet. If you’ve ever dipped your toe into the Paleo diet, you’ll find that “IT” Whole30 is very similar. To understand the differences (and there are a few important ones), check out our post on the differences between Paleo vs. Whole30. Thank you so much Lisa – it’s hard to catch all typos alone. I appreciate your help! What if I have a 100lbs to lose and I have an under active thyroid but I take synthetic for it. I want to be successful. I’d suggest you talk to your doctor to be safe! Hey Yvonne – many people keep up their whole30 lifestyle longer than 30 days. Just remember, you don’t want to focus too much on weight loss – focus instead on how your body feels! I am sorry but how is meat, seafood and eggs “clean eating” eggs are not good for you at all, seafood is dirty and meat, don’t get me started on meat! But I guess when it comes to “clean eating” everyone has a different veiw on it. Clean meaning, unprocessed. If you are a vegetarian or vegan you know meat and dairy isn’t what it’s cracked up to be. you will need to find your protein in other places. Can you have honey in your coffee? Can I still take Ibuprofen ? You seem to be mixing up books. “It Starts With Food” is by Melissa Hartwig. You’re thinking of a different book. You should be able to find a brand of almond milk without coconut milk! Also try cashew milk if for some reason almond milk and coconut milk aren’t working for you. We have a list of Whole30 complaint almond milks here! Isn’t Califia Farms almond/coconut milk compiant? Can you have baked potatoes or sweetpotatoes? Yes, check out our Whole30 Beginners Guide for all the details to questions like these. I am on my 8 day of the Whole30 and I feel great but I have been craving sweets like crazy. I am also back in the gym 3 days a week for now. My husband and I did a round of whole30 and loved the way we felt and feel. We pretty much made a lifestyle change because of it. We eat clean during the week and occasionally have a cheat meal on the weekend. I found that dairy effects me the most and now only have it in moderation. Great way to start a lifestyle change!